I've interviewed JibJabber Gregg Spiridellis a couple of times, last time at their studios in Venice, California. Wish I'd had this clip to post as an extra at the time to show a little slice of their workplace and give a little company history - it's an interview with CNN. 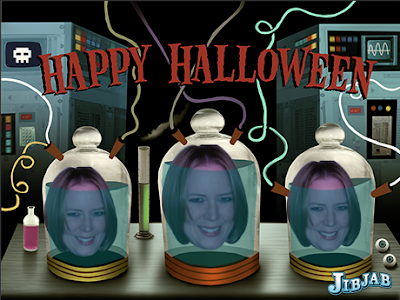 But it's never too late to share the JibJab love, especially when they've got a bunch of new Halloween videos and ecards. Posted by Diane Kristine Wild at 5:27 p.m.
Mark Critch of This Hour Has 22 Minutes and Jonas "Heironymous Slade" Chernick of The Border were the witty and entertaining guests on the final (for now) TV, eh? show on Blogtalkradio. 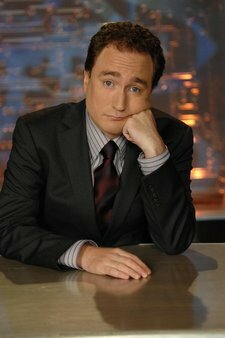 Mark Critch talks about stalking the trail of Sarah Palin in Alaska, impersonating Danny Williams in China, and teaching Beijing schoolchildren useful English phrases like "Stephen Harper lied to the people of Newfoundland and Labrador." Having just completed a half marathon and demonstrating excellent social skills, Jonas Chernick proves he's not really like his character (as long as you don't ask his friends and family, apparently). He talks about what's next on The Border and what's coming up for Slade, his forays into writing and theatre, learning about current events from The Border scripts, and why he never wants to write one. Posted by Diane Kristine Wild at 12:30 p.m.
Posted by Diane Kristine Wild at 7:10 p.m. It's the last TV, eh? show on Blogtalkradio this Sunday, at least for the foreseeable future, and I've got great guests to help me go out with a bang: Mark Critch of This Hour Has 22 Minutes and Jonas Chernick (Heironymous Slade) of The Border. Listen live Sunday, October 19 at 11 am Pacific/2 pm Eastern and join the discussion by calling 646-200-4063 (or sign in and look for the Click to Talk button on the show site). Or catch the podcast afterward. Posted by Diane Kristine Wild at 7:36 p.m. This is where I've been: Osoyoos. 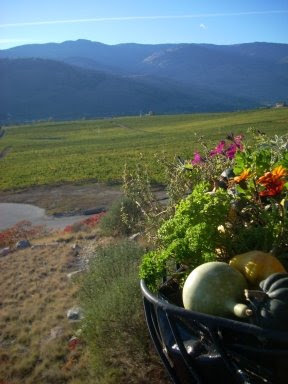 Picture taken during Thanksgiving dinner at the Burrowing Owl winery. Posted by Diane Kristine Wild at 8:56 p.m. I always have fun with my silly Emmy predictions posts, even though so much of my opinion is based on hearsay and prior bias rather than any passion for most of the season's nominated shows themselves. It occurred to me as I was writing this year's entry that because I sample so many Canadian shows as part of my TV, eh? duties, for once in my life I have seen more Gemini nominees than Emmy nominees. So I did consider for a few minutes writing a similar Gemini prediction post. And then I came to my senses. I was exaggerating when I said no one would read it. Some of the people whose shows I mentioned might read it, and based on past history, there's a good chance I'd open my email to much ego-fuelled vitriol unless the post was about how every show was deserving, rah rah rah. Because in the world of Canadian television, the Internet is not for fans. There's a small fan base in any case because of our smaller population and the anemic viewership most Canadian shows generate. On top of that, too often opinions are shouted down and ridiculed by people who draw a paycheque from the industry, some of whom choose not to identify themselves as such. It's part of the professionalism discrepancy between the US and Canadian systems that's evident in other ways. One of the most damaging examples is the disdain for the populace that oozes out of many industry discussions. Television Without Pity was co-founded by Canadians, but if there were a TWoP-like site focused on Canadian TV, it wouldn't be dominated by fans being merciless about the shows they watch, it would be overrun by industry people being merciless about their potential audience base. Unless of course it’s election season, in which case contempt for ordinary Canadians turns into passionate attempts to speak for ordinary Canadians, while ordinary Canadians stay silent or speak for themselves. No wonder Stephen Harper believes it’s politically expedient to turn arts funding cutbacks into votes. Berating people who care enough to talk about a show is an interesting way to try to cultivate interest, as is disparaging the population at large, but it's in keeping with the Canadian industry's witness protection philosophy. "Canadian TV: Shh, don't tell anyone we're here." The addendum: "And if you fools accidentally discover us, scram." I started TV, eh? not because I cared about the industry, but because as a viewer I cared about people like me, never getting to make the choice of whether a Canadian show was worth watching or not because I'd never even heard about them. Unfortunately, now what I hear, read and experience leads me to believe that the Canadian industry cultivates and therefore deserves its obscurity. Viewers, on the other hand, deserve a thriving homegrown industry (read John Doyle of the Globe and Mail and Mark Leiren-Young in the Vancouver Sun if you're questioning why). So I can only hope awards season and election season will pass without further damaging its reputation and its foundations. Posted by Diane Kristine Wild at 6:35 a.m. It was a fun show today, with a lovely and gracious Amber Marshall of Heartland at the top of the hour, funny and eloquent David Alpay of The Tudors at around :15, and witty and articulate Trish Stratus of Stratusphere at :40. And I don't just say that because none of them stood me up today - guests like these make it all worthwhile. I'm still retiring after the Oct. 19 show, with Mark Critch of This Hour Has 22 Minutes and Jonas Chernick of The Border. Posted by Diane Kristine Wild at 12:41 p.m. I'm a fairly analytical person. I like things to make sense, have order, be logical, and I puzzle over them until I can make them fit into some semblance of sense, order, and logic. I also believe that life rarely makes sense, has order, or is logical, and for some reason that thought comforts me more than the platitudes of "Everything happens for a reason, blah blah blah." That's where the poetry of life comes in, and actual poetry, and even some song lyrics. I'm the DJ of my shared office at work by virtue of my better computer speakers, so my officemate and I were talking about examples of lyric snippets we love, but we realized that talking about why they affected us killed what it was we loved. Sometimes analysis needs to make way for simple appreciation of wordplay, or the evocation of a particular feeling. "I could change my life to better suit your mood." "Every time she sneezes, I believe it's love." "Beautiful minds, trying to keep it independent in recruitable times." "It’s 3 am, I must be lonely"
"In the cathedrals of New York and Rome, there is a feeling that you should just go home, and spend a lifetime finding out just where that is." Posted by Diane Kristine Wild at 11:58 a.m. It's surprising, I know, but it seems that saying "Argh! I can't do it anymore! It's too much trouble!" is not the way to get someone to volunteer to take over the TV, eh? show on Blogtalkradio. Besides, I'd tried and failed to get a regular co-host early on - I never did really want to be the host myself - so I wasn't holding out much hope that anyone would want to take it over completely, scheduling and all. 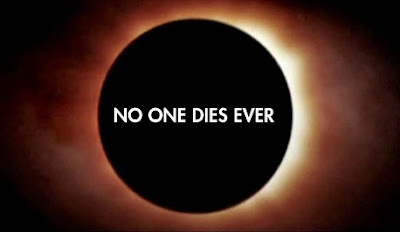 I've got a couple of shows already lined up, and then they'll likely take an extended hiatus, potentially to be resurrected later, potentially to fade into oblivion. Amber Marshall, who plays Amy Fleming on Heartland, which returns to CBC this Sunday. David Alpay -- Mark Smeaton on The Tudors, airing Tuesdays on CBC. Trish Stratus of Stratusphere, airing on CTV on Saturdays. I'm taking a break for Thanksgiving weekend but there's a show on Oct. 19 too, with Mark Critch of This Hour Has 22 Minutes and Jonas Chernick of The Border. Listen live this Sunday at 11 am Pacific/2 pm Eastern and join the discussion by calling 646-200-4063 (or sign in and look for the Click to Talk button on the show site). Or catch the podcast afterward. Posted by Diane Kristine Wild at 5:40 p.m.